All-new for 2017, the Kia Sportage compact SUV is sharply dressed inside and out, boasts loads of technology, safety and comfort amenities, and continues to offer one of the best warranties in the business. As a rival to best-selling crossover SUVs such as the Honda CR-V, Toyota RAV4 and Ford Escape, the Sportage holds its own in all but efficiency. Kia Sportage- couple snags, would buy again. Overall the car has ran great. Seats are comfy, and the headrests are too. Black exterior with tan interior. I don't think I would do black again, you can see all the dirt really easily. I have had it for a year and a half now, and a couple things have gone wrong. First, one of the tires was leaking air from the stem. I kept taking it in to get air put in the tires almost every 3 weeks to a month or so. I asked them to check it, and they said it was fine. But it was the same tire making the sensor go off. Went back for an oil change and asked them to check it, they found the leak and I had to buy a new tire since its not covered under warranty. The second thing was my windshield washer fluid contained cracked somehow and was leaking so I had that replaced under the warranty. The last thing that has happened (knock on wood) was my passenger side window. I noticed is beginning to slow down when I tried to roll it up. One day it stuck, and it wouldn't roll back up. I turned off the car and waited 10 minutes, turned it back on and it rolled up. No issues since then. I think these are all flukes, because at the end of the day when my lease runs out I'll probably just get another one, maybe a sunroof next time. Good features, only one minor issue. The backup camera has really been a lifesaver. I was used to driving a smaller vehicle before, and having this as a standard feature really helped in acclimating myself to backing it up. The seats are spacious and comfortable, with enough arm room in between so that my boyfriend and I do not feel like we're cramped in together. The one problem I have had with the vehicle is that the steering column tends to lock up when I turn it off and the wheels are not perfectly straight. Other than that, it is fairly fuel-efficient, especially with the option to switch to "eco" mode, which lowers some performance, but really saves on fuel. The media package was exactly what I was looking for without going overboard, and I love the built-in Bluetooth capability. It makes taking calls on the road a breeze. 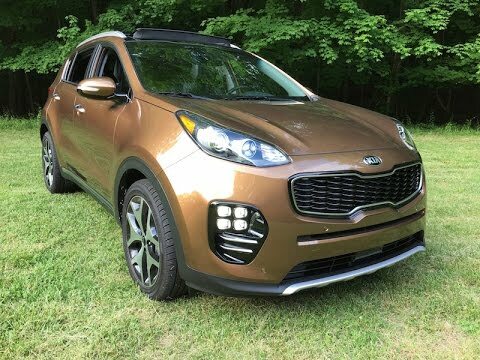 2017 Kia Sportage. Great car and very affordable. My Kia Sportage is great in the snow and pretty good on gas as well. The acceleration is pretty good for a 4 cylinder. So far it has been very reliable. It does really well as far as gas mileage on long trips. Short trips is another issue not as good gas mileage, but I do feel very safe in my Sportage though. The comfort is pretty good and it is a sturdy automobile. I wish I would have got more accessories with it like automatic seats and more plush seats. I also wish the back up camera was a little bigger. Other than that this car is much better than my Kia Sportage from years back. The price was a little more but for what I want its done me and my family a good job in the last 2 years. Kia has gotten much better with their products in the last couple of years. Kudos to them. 2017 Kia Sportage Review and Road Test - In 4K UHD! Kia Motors America (Kia) is recalling certain model year 2016-2017 Sorento vehicles manufactured October 27, 2014, to August 25, 2016, and 2017 Sportage vehicles manufactured December 10, 2015, to August 26, 2016. The affected vehicles are equipped with an accessory trailer hitch wiring harness that, due to a malfunction of the tow hitch module, may result in the trailer brake lights being constantly illuminated. As such, these vehicles fail to comply with the requirements of Federal Motor Vehicle Safety Standard (FMVSS) number 108, " Lamps, Reflective Devices, and Associated Equipment." Kia will notify owners, and dealers will replace the trailer tow hitch harness, free of charge. The recall began January 18, 2017. Owners may contact Kia customer service at 1-800-333-4542. Kia's number for this recall is SC142.